Welcome to Sixt in Gran Canaria! 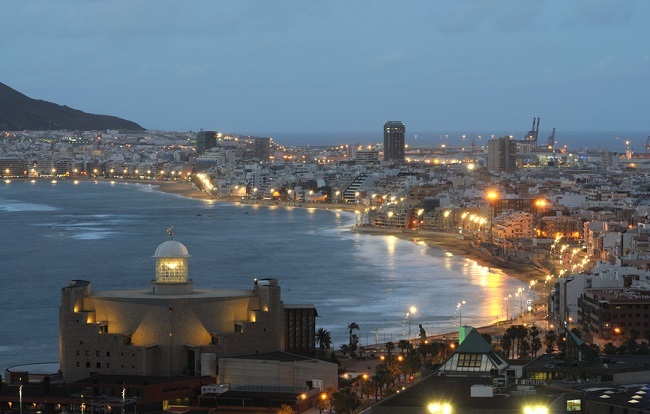 Make the most of your time on this beautiful island when you rent a car in Las Palmas. Enjoy modern vehicles, cheap discounted rates and excellent customer service while our premium fleet is designed to suit any budget from economical to holiday treats. We have cars for individual travellers, families or larger groups so open the menu below and start planning your holiday driving. Booking a Sixt car hire in Las Palmas is straightforward and should your plans change, cancellations are often free. Your car rental is supplied by recognised brands such as Ford, Renault, Opel or Seat and can be collected from the airport. Select from our attractive range of extras when you make your online booking. These include Sat Navs and child seats along with our reduced deductible insurance policy that limits your driving risks. Navigate narrow island roads in economical and compact saloons. Enjoy the beautiful coastline of Las Palmas in convertibles or sports cars. Spacious estates and 4x4s have room for family members and all their luggage. You must be 18 or over to rent a car in Las Palmas and have held a full driving licence for at least one year. If you are under 23, surcharges may apply. EU driving licences and international licences for European non-residents are valid in Las Palmas provided they are in Latin script. If not they must be accompanied by an International Driving Permit (IDP). It is possible to add extra drivers during the booking process. Your driving licence will be required when you collect your car rental. Call the police on 112 should you be involved in a road accident in Las Palmas and inform Sixt as soon as possible. Accident report forms can be found in your car hire vehicle. Las Palmas is situated on the island of Gran Canaria, one of the greenest of the Spanish Canary Isles and perfect for a tranquil holiday. One third of the island is a UNESCO Biosphere Reserve with lush rainforests, desert landscapes, strange rock formations and volcanic craters while its capital is an architectural delight with colourful houses and stately mansions. Collect your car from the airport and start your island road trip by making the short journey to Vegueta, the islands oldest district. It was here that Christopher Colombus spent some time here repairing his fleet, and there is a small museum commemorating his adventures. 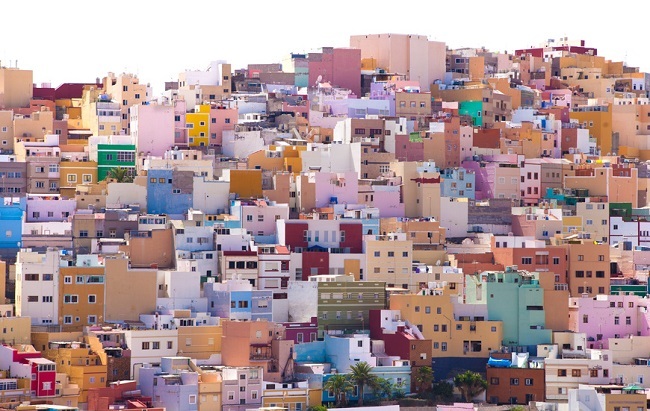 After soaking up the history of the islands discovery, head to Agaete in the north-west with its beautiful white buildings for a spot of relaxation. Finally, to round off your road trip, drive to the iconic Roque Nublo - Gran Canarias clouded rock. Stop here for a few moments to enjoy breaktaking views all around. Further south is the Pilancones National Park with refreshing streams, waterfalls and mysteriously shaped rock formations. The views on the island change dramatically depending on the time of day. The sky will be clear in the mornings but the area is much more atmospheric later in the afternoon as clouds seem to spill out of the crater. Tip:Most of the roads around Las Palmas follow the contours of the land meaning you have to navigate steep inclines interspersed with sharp bends. Leave plenty of time for any journeys and always expect to see both animals and pedestrians on the road. Gran Canaria is best renowned for its capital Las Palmas, but Maspalomas and Tejeda offer both lively entertainment and stunning scenery. Gran Canarias capital Las Palmas is the hub of the island, with a busy port bringing in visitors every day. There is excellent shopping to enjoy here as well as the famed white sand beaches, which stretch for miles around the coast. Soak up the historic colonial architecture of Vegueta, before stopping by one of the daily markets to buy some holiday souvenirs. 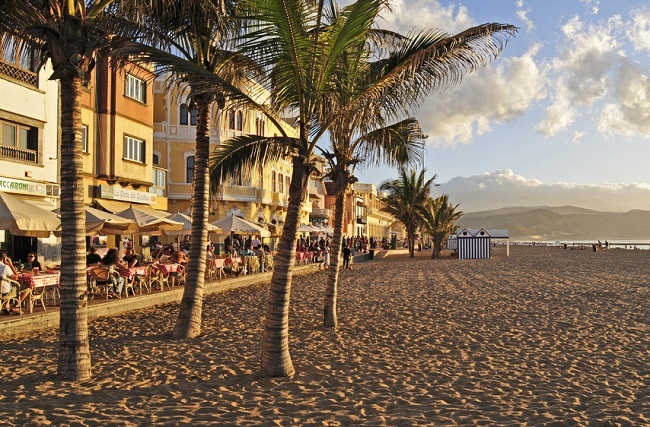 Maspalomas a popular resort area on the south of the island with all the lively bars, restaurants and cafes you might expect. It is also lined with some of the most beautiful beaches on the island. If you have already exhausted your time on the sun loungers, you need simply turn around and look at the incredible Dunas de Maspaloms sand dunes, which stretch for miles next to the beach and offer an alternative landscape for exploring. Nestled in the centre of the island, this delightful village offers an amazing contrast to the ocean sprayed towns of the coast. With steep winding streets and beautiful old balconied buildings, you can immerse yourself right into the dramatic natural landscapes from this small historic village. 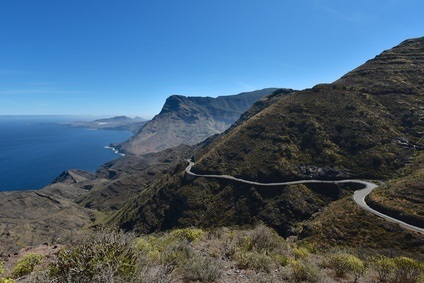 Gran Canaria is home to a variety of microclimates, but enjoys warm temperatures throughout the year. From winter to summer, averages range from 18 degrees to 26 degrees or higher. Fresh fish and seafood, especially sardines are an important part of Las Palmas%u2019 cuisine. Fish cooked in spicy sauces showcase the island's New World influences while small squid or Chiperones are simply grilled in oil. Canary Isle potatoes have a flavour all of their own especially when cooked in their skins and finished with lots of local sea salt. Meals often start with fried goat's cheese, sausages or Jamon Serrano while paella with local variations is often found on restaurant menus. Much of the island's wealth came from sugar so it is no surprise that a favourite dessert is the Rapadura. This conical-shaped cake is made from molasses, sugar, almonds and cinnamon. Safe beaches, warm water and a typically warm Spanish welcome make Las Palmas a delight for children and as a bonus the almost total lack of light pollution make it a great place for learning about astronomy. Children will enjoy visiting the myriad entertainments provided for families, such as crazy golf or petting zoos.